Tuesday 11 September shortly before 2 pm, a major fire broke out at the Lognan Cable Car midstation at Les Grand Montets (1,972m above sea level). No one is injured but the damage is disastrous, "several cables have melted and a cabin has fallen," reports Mathieu Dechavanne, the president of the Compagnie du Mont-Blanc. According to France Bleu, the restaurant in the station is also affected. "The entire building is destroyed, it's a disaster," said Mathieu, in total, 500m² of buildings have burned. The damage is in millions of euros and the cable car will be stopped for several months. Fortunately, no one was injured because the cable car was closed to the public. Moreover "all workers present on site were evacuated," said the Fire Departmen and Rescue Service (SDIS) of Haute-Savoie. A gendarmerie helicopter made several flights to make sure that no hiker was near the incident. At the moment the sector is forbidden due to the risk of falling cables. Authorities suspect the fire may have started in the building’s attic, where sealing work was being done. The structure of the station had dry wood so flames spread immediately into the roof, making any intervention useless and impossible. It was very difficult to handle the fire at that altitude, fifty firefighters were involved. "The intervention is complicated" declared the SDIS, service, "It is necessary to route equipment and tanker trucks via small roads, at over 1900m altitude.This takes time"
They used a private helicopter to drop large buckets of water on the blaze, the machine carried about 700 liters each turn. Despite this, it took several hours to extinguish the flames. Two load-bearing cables, located on the right-hand lane of the lower section have melted immediately. "The roof burned completely. All the cables have melted and one is even broken." Because of that, a cabin of the first section fell to the ground. Fortunately, it has not fallen very high and should be repaired. The 2nd cabin was near the ground and fell almost gently into the grass. 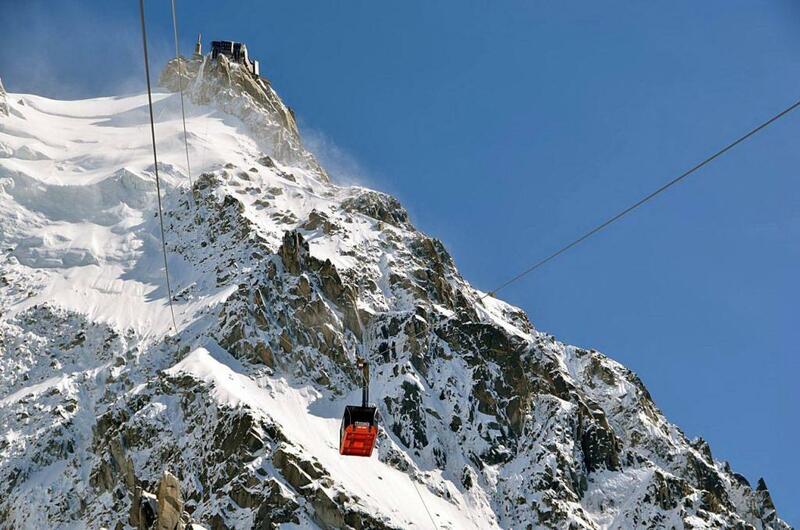 Compagnie du Mont-Blanc went to many unfortunate events, the second section of the Aiguille du Midi has been closed since May and Panoramic Mont-Blanc's carrier cable broke this winter. Also, Planpraz gondola on the Brévent side had to be closed for a few days for a pulley change.